This creamy, homemade eggnog is filled with bourbon, spiced rum, Christmas spices and the whole thing is made almost lighter than air with lots of meringue whipped in. Eggnog gets such a bad wrap because all the store-bought brands just can’t compete with the homemade version. Most of you wouldn’t pour an old fashioned or margarita from a bottle and expect it to be top notch. Is this classic holiday treat bourbon, and spiced rum spike a creamy almost custard-like base. Things are lightened up with the incorporation of meringue just before serving. 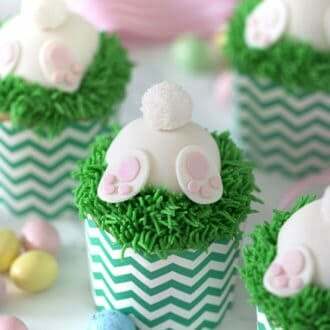 Enjoy in moderation! NOTHING beats making this a day ahead is a great idea. All of the flavors will have more time to blend together and you’re be less busy the day of. Just reserve the egg whites and whip them before serving then whisk them in just before serving. You can use less of the meringue if you’d like a denser, less frothy drink. If you have some of the drink left over I highly recommend using it to make eggnog cupcakes or my delicious eggnog sheet cake! Play around with the spices used. pour a sample drink out and experiment away. A dash or cardamom or allspice might make all the difference to you! You can totally use brandy in place of the bourbon if you’re a fan. Garnish each drink with a pinch of nutmeg and cinnamon. How do you make eggnog? Separate yolks and whites of 6 eggs into two bowls. Add one cup of sugar to the egg yolks. Add one tablespoon of vanilla bean paste to the yolk mixture. Add one cup of bourbon and 1/2 cup spiced rum. Whisk until combined. Add 1 cup cream and 2 cups whole milk. Whip egg whites in a very clean bowl. Drizzle in two tablespoons of sugar once the eggs begin to froth and whip until soft peaks form. Fold whipped egg whites into mixture and serve. Add a dash of cinnamon and nutmeg. This is where you’ll do some tasting and add more until you’re happy. I used 1/4 tsp of nutmeg and almost 1/2 tsp of cinnamon. 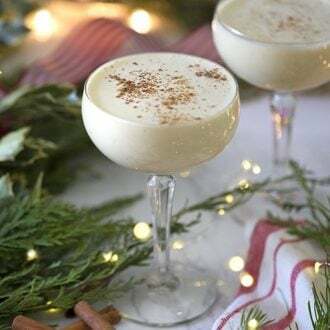 If you’ve tried this homemade eggnog then don’t forget to rate the recipe and let me know how you got on in the comments below, I love hearing from you! 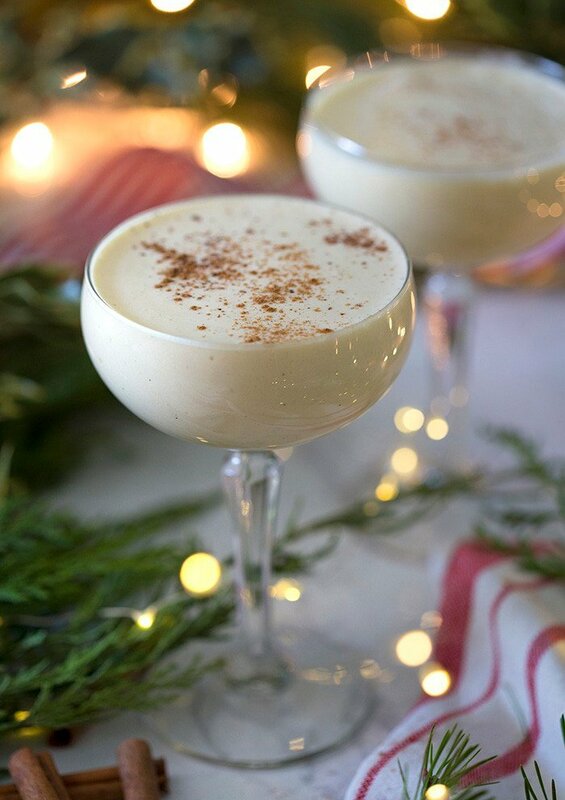 This quintessential Christmas cocktail is filled with spiced rum, bourbon, lots of creamy goodness, and it's a thousand times better than anything store-bought. Separate eggs yolks and egg whites. In the egg yolk bowl, combine sugar and vanilla paste. Whisk together. Add bourbon and rum. Whisk until combined. Add cream and whole milk. Add a dash of cinnamon and nutmeg. NOTHING beats making this a day ahead is a great idea. All of the flavors will have more time to blend together and you're be less busy the day of. 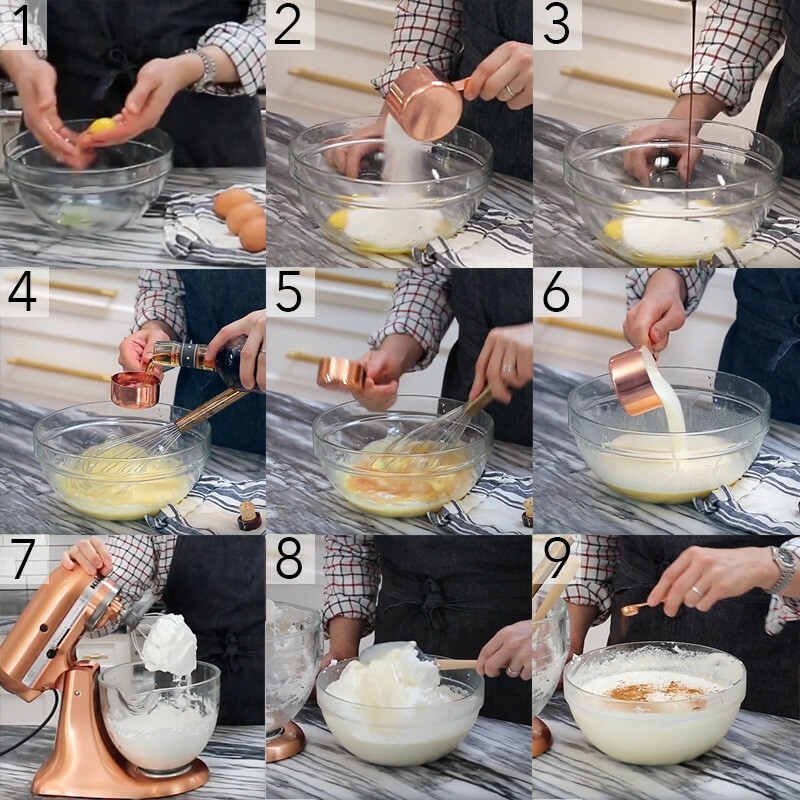 Just reserve the egg whites and whip them before serving then whisk them in just before serving. You can use less of the meringue if you'd like a denser, less frothy drink. If you have some of the drink left over I highly recommend using it to make eggnog cupcakes or my delicious eggnog sheet cake! You can totally use brandy in place of the bourbon if you're a fan. 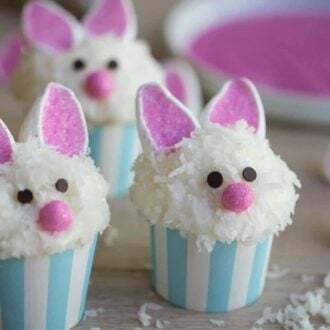 IF YOU LOVE THIS RECIPE TRY THESE OUT! 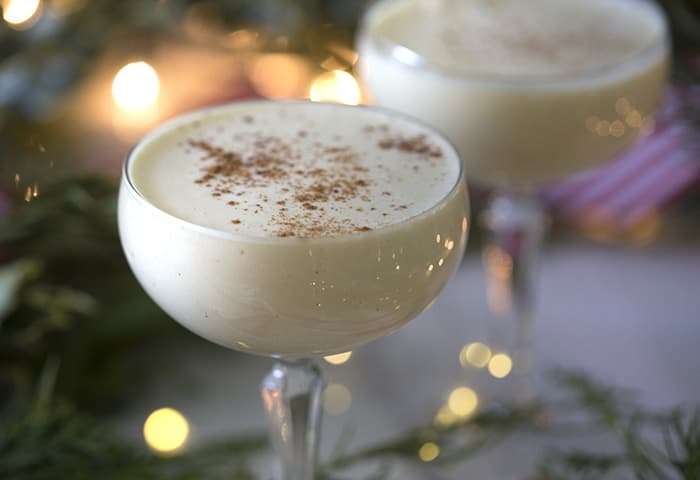 Hi , I was wondering if it is possible to lose the alcohol in the egg nog? You can absolutely make this recipe without alcohol! Loved this recipe! And you’re so cute !!! Such a fab ! I believe in you! I’m exited to hear what everyone thinks! Can’t wait to try this. I have made from scratch eggnog before with fresh milk from my cow which she is dry right now. So I have my heavy cream from the store ready to make for some eggnog just not sure if I want to add alcohol or not. Of course I want to but then kids can’t drink it. Hmmm… I’ve never made with the meringue before so thank you for the recipe. I love all your recipes! Great job. Keep them coming. Hope you love it! One batch DEFINITELY needs the booze! Thanks for stopping by! 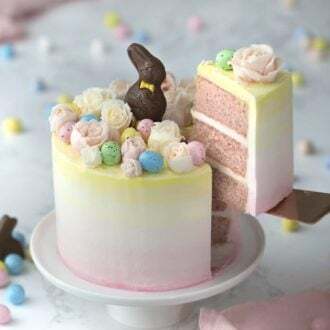 I’m John, a husband, dad to twins Lachlan and George, Los Angeles native, and an avid baker and cooker of all things delicious thanks to a life long education from my mother. 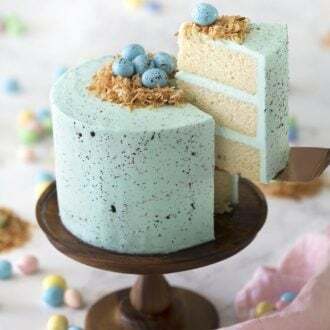 This blog is where I share all of my kitchen creations! 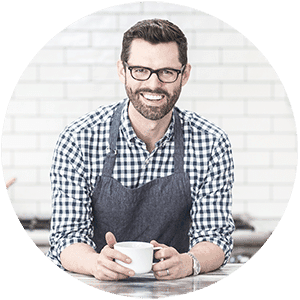 Sign up to receive recipes, recommendations and tips straight to your inbox! Get Notified when I publish a new post.